The simplehuman Sensor mirror is not a magnifying mirror by any usual standards: stare into the looking glass and it turns pores into moon craters, fine facial hairs into gargantuan tropical fronds with girths as wide as a lamppost. This is the sort of power mirror that might be used to help perform complicated and intricate brain surgery, the type of mirror borrowed by NASA when they need to fuse together two alien DNA spirals without having to look directly at the source. It’s a mirror that sees further than the skin – I’m pretty sure it allows you to see into your very own soul. Or maybe even into the future. Everyone who has looked into my simplehuman Sensor mirror (it’s in the dining room at the moment because my sister-in-law was doing her eyebrows) has been instantly addicted to its supernatural magnifying abilities. “It’s like looking at a whole different face!” they say. “A whole new world!” I just smile, knowingly, because I’ve had quite some time to get used to the Simple Human now. My eyes can switch between Mirror World and real life quickly and easily – I no longer have to do a double take and think what the actual f*ck is that thing underneath my left eye? I know, instinctively, that what looks like an extraterrestrial wart growth is, in fact, merely a small skin tag that has been magnified to eight-million (ten) times its normal size. 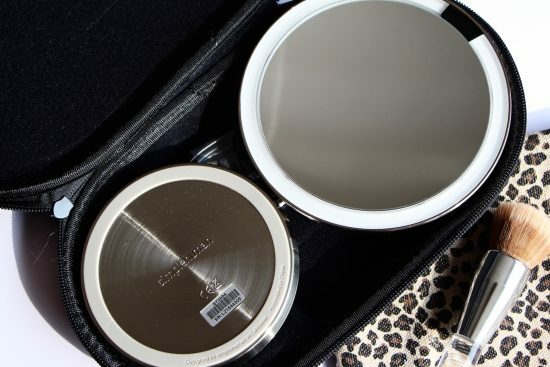 It goes without saying – surely – that this is the mirror you need if you like eyebrow tidying, chin-hair plucking or any sort of pore-squeezing. It’s utterly addictive to be able to see exactly what’s going on, almost at a molecular level. And well worth the steep price-tag if you don’t want to be constrained by a long electrical wire and the need for a plug socket; the simplehuman mirror is charged via USB so you can put it anywhere, including next to the sink or on the ledge of the bath. The “Tru Lux” light (a sort of ring-flash affair, very good daylight tone) comes on when your face approaches the mirror and turns off when you move away, so the battery lasts an absolute age. What else? Hm. 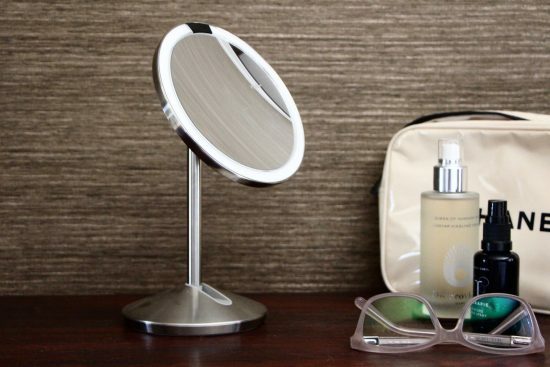 Modern styling (I like) – very sleek and compact and well thought-out, not bulky and ridiculous like some of the other offerings out there – and a clever design that folds the mirror flat so that it can be placed in its travel case. A good call if you’re the sort of person who might constantly knock this from the shelf if it’s left there – just fold it up until next time. Almost useless for doing your actual makeup in – it’s just too close for my liking – this is a face-poker’s mirror, a tool for faffers and fidgets, people who like to examine their eyelashes and trim their nose hairs to absolute perfection. I have become one of those people, and I’m not at all regretful. I bought my Simple Human mirror from Amazon here – I paid £99.99. Previous Post How I Got My Baby To Sleep Through The Night.